Alt text: Wikipedia trivia: if you take any article, click on the first link in the article text not in parentheses or italics, and then repeat, you will eventually end up at "Philosophy". I wonder how this affects readers of Uncyclopedia. Last edited by Felstaff on Wed May 25, 2011 8:13 am UTC, edited 1 time in total. It's surprising how much I use Google and Wikipedia in live chats or texting. Not really to sound smart, just to give my friends the information they need and SHOULD be able to find on their own using the same methods. It is actually true if you start at "Spark Plug." It is not necessary to check any other page. Blew my extended mind right off! It's true! I tested on three articles! Uncyclopedia is out? Well, I guess it's back to just plain cyclopedia. Wait... I have it in a ZIP file. Take that, Oscar Wilde. Armitando wrote: Alt text: Wikipedia trivia: if you take any article, click on the first link in the article text not in parentheses or italics, and then repeat, you will eventually end up at "Philosophy". The alt text is incorrect. There are several articles ("computer software" and "oral history" for instance) that will trap you in loops. It's rather funny - I'd talked about this with a friend of mine a couple days ago, and I've spent the last few looking for those loops and planning to write some code to find all of them. Last edited by sargeras0000 on Wed May 25, 2011 4:08 am UTC, edited 1 time in total. Heh... Randall must be reading the forumand stuff. Either that, or the forum thinks like Randall. Get out of our heads? Dear lord, the philosophy trivia works. Took several dozen links at most, starting from The Hitchhiker's Guide to the Galaxy, and it came dangerously close a couple of times beforehand. Well, it works with today's featured article pretty quickly. Fascinating. That's amazing, I started on today's featured article, Hitchhiker's Guide to the Galaxy, and it did end in philosophy! It came close, then went away from it for a few pages, then I was at philosophy! I'm going to try it with random articles too, this is very entertaining. Last edited by SenderMage on Wed May 25, 2011 4:10 am UTC, edited 1 time in total. "Bernanke got a solid grip on Greenspan’s collar and hurled him through the fourth wall, knocking you to the ground." "Paleolithic" will lead to a loop. It's not true. Check out the infinite loop between "Puppet" and "Puppeteer", one that I found on my second random article search. Did Randall not check or is it a meta-joke? Armitando wrote: "Paleolithic" will lead to a loop. If one disregards a link to Wiktionary, "autarky" and "self-sufficiency" are looped. Um, okay. I think we need to boycott this forum until Randall comes up with stuff himself. That's either a weird coincidence or just awfully pathetic. Last edited by jnc314 on Wed May 25, 2011 4:20 am UTC, edited 1 time in total. Thoroughfare leads to Road, which in turn leads back to Thoroughfare. Also interesting. The path to philosophy went through mathematics in almost every case. sargeras0000 wrote: The alt text is incorrect. There are several articles ("computer software" and "oral history" for instance) that will trap you in loops. Oral history leads to a loop but computer software leads to philosophy. It tends to be through either that or science, in my experience. Last edited by sargeras0000 on Wed May 25, 2011 4:14 am UTC, edited 1 time in total. Actually, this should work for almost any article given enough time, due to simple random chance. Also, tested out "Computer Software" Got to philosphy. This is like a child playing the "WHY" game. When they ask WHY enough you have to answer "JUST BECAUSE". Need more help or clarification? Feel free to PM me. I have never seen anyone on any website get a virtual beating for lack of proper grammar and capitalization. I got there through math and science. I started on the Steve Irwin Wiki, since that's where I was at the time. fljared wrote: Actually, this should work for almost any article given enough time, due to simple random chance. Also, tested out "Computer Software" Got to philosphy. Are you counting the italicized text with the link to the disambiguation? No, the loops everyone is pointing out are not exceptions to the rule. They are places where Wikipedia can be improved by some judicious editing. The roll over text reminds me of a wikipedia game we used to play. The aim was to get to the page on "Nazi Germany" from a random page. First you click random article, and then you use an internal link from that page to navigate to the next page. You continue using the internal links until you get to Nazi Germany. You can pretty much get there within 5 clicks or less from any random article. So far I am 4/4 with the link game, all four have reached philosophy through mathematics. twistees wrote: No, the loops everyone is pointing out are not exceptions to the rule. They are places where Wikipedia can be improved by some judicious editing. No reason they can't be both, no? At least - exceptions till the exceptions are fixed. And it went through Mathematics. A way to make this a game could be finding the page that is the most hops away from philosophy (without loops, of course). You're half right. Oral History leads to a loop ("Wikipedia's guidelines" is not italics or parened!) and ends up at Typography -> Typesetting -> Font -> Typography. Ignoring that it's an even smaller loop between Oral History and the Oral History Society. History of the world also loops. Last edited by Draco18s on Wed May 25, 2011 4:25 am UTC, edited 1 time in total. Dang, I just can't seem to reach philosophy. I keep getting trapped in the Greek Loop, as I've come to call it. 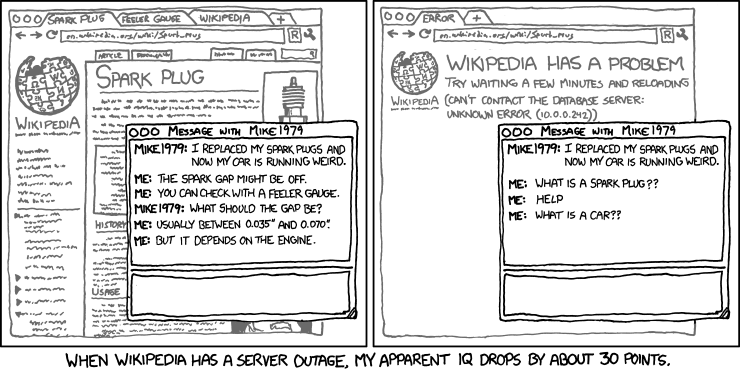 Maybe Wikipedia should add a tag "This article does not conform to the XKCD #903 rule. Please consider rewording to ensure compliance." Draco18s wrote: You're half right. Oral History leads to a loop ("Wikipedia's guidelines" is not italics or parened!) and ends up at Typography -> Typesetting -> Font -> Typography. Ignoring that it's an even smaller loop between Oral History and the Oral History Society. You count all parentheses, then? I'd been just counting the explanatory ones like "(German: Bundesrepublik Deutschland, pronounced [ˈbʊndəsʁepuˌbliːk ˈdɔʏtʃlant] ( listen))" that are basically as content-less as the introductory italics. And boxes? My, my, you're a sly one. EDIT: Check "computer software" again, will you? POST SCRIPT: Aww. I was going to change it back. Last edited by sargeras0000 on Wed May 25, 2011 4:30 am UTC, edited 1 time in total. Nicad wrote: I find it interesting that the alt text seems to be more of a focus of discussion than the actual comic. ...I have just wasted 20 minutes trying to find a counterexample which is not a loop.